Our cottages have been designed and built with luxury in mind to give our guests all the modern day home comforts you would expect. 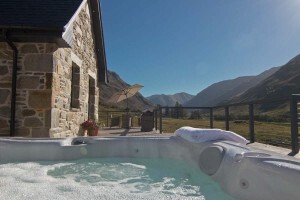 Imagine relaxing in the hot tub looking south across the River Chro to the world famous 5 Sisters of Kintail mountain range. Nestled right in the mountains there are plenty of outdoor activities to keep you active, there is also lots of wildlife to be seen. 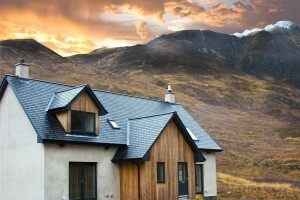 Innis-a-Chro Croft Cottages, Innis Cottage & Chro Cottage has to be one of the ultimate secluded hideaways in the North West Coast of Scotland. This exclusive croft is situated at the head of Strath Croe which is surrounded by two rivers and accessed only by a bridge, giving the croft the seclusion that many people desire. 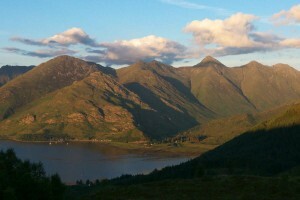 The cottages are set in some 2000 acres of National Trust for Scotland land at the entrance to Glen Lichd giving you some spectacular views of the glen and immediate access to the mountains for walking. The cottages have been designed and built with luxury in mind to give our guests all the modern day home comforts you would expect, making a great holiday destination for any time of the year.